Update: Mar 2019. Due to builder feedback I moved the FX loop to reduce signal level. It is now placed immediately after the volume pot. Update: May 2018. 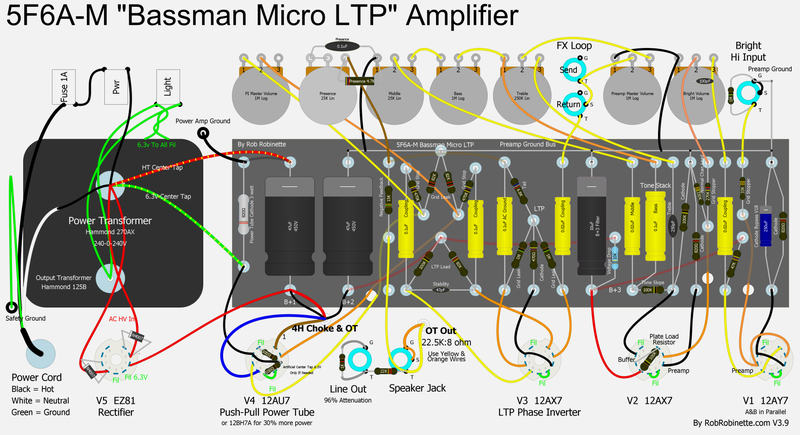 The Bassman Micro LTP layout and schematic were added. Using a Long Tail Pair phase inverter instead of a cathodyne allows the addition of a true 5F6A negative feedback loop and presence control. The overdrive tone is also more 5F6A authentic. Update: May 2017. 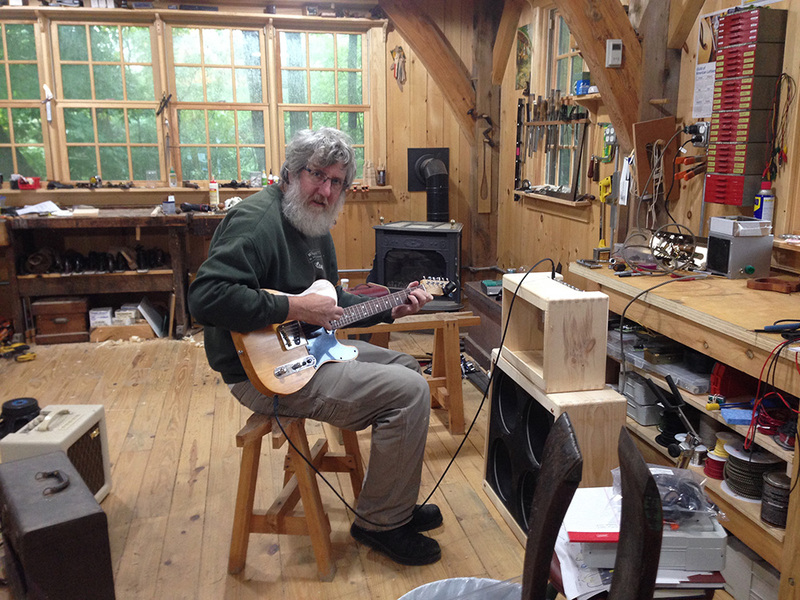 Bassman Micro builder Reuben gigs with his amp. Here's a soundcloud of Reuben's Bassman Micro in the mix. Update: March 2017. 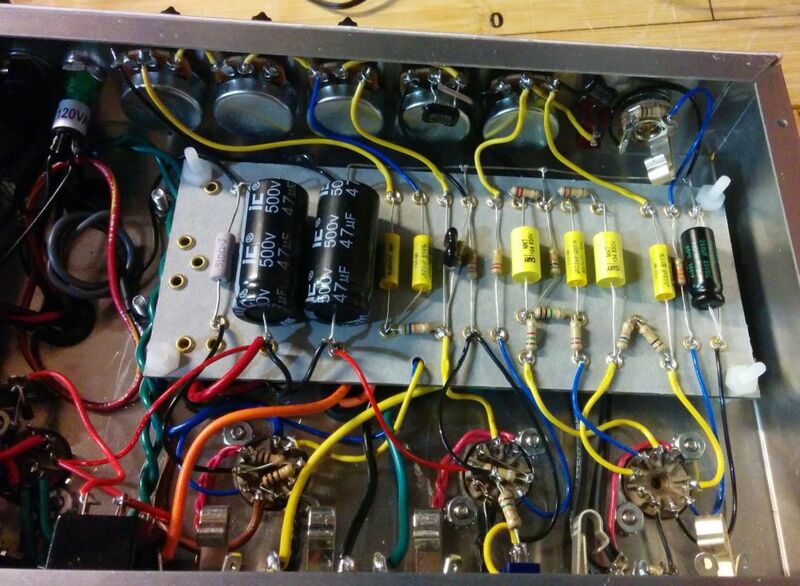 I added a filter capacitor, made the choke mandatory and moved it to filter the entire amp to reduce the amp's hum level. I removed the feedback circuit because it encompassed too much of the amp and hurt the effectiveness of the tone stack. Update: January 2016. 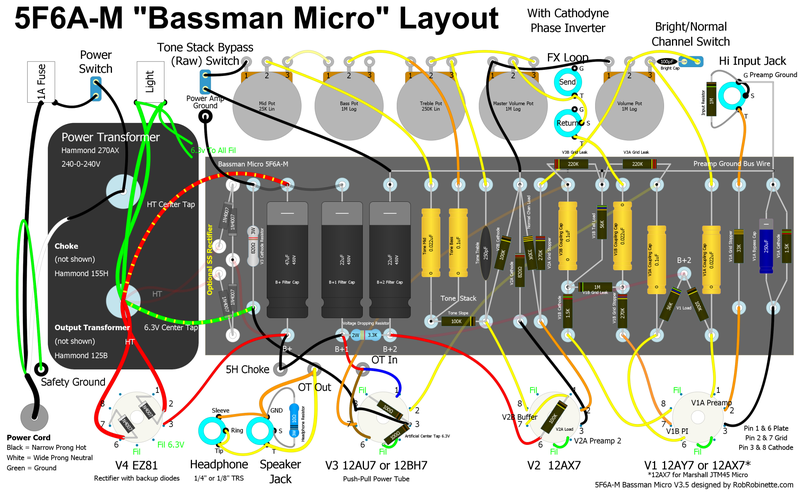 Bassman Micros have been built in France, the Czech Republic and the USA. Update: August 2015. 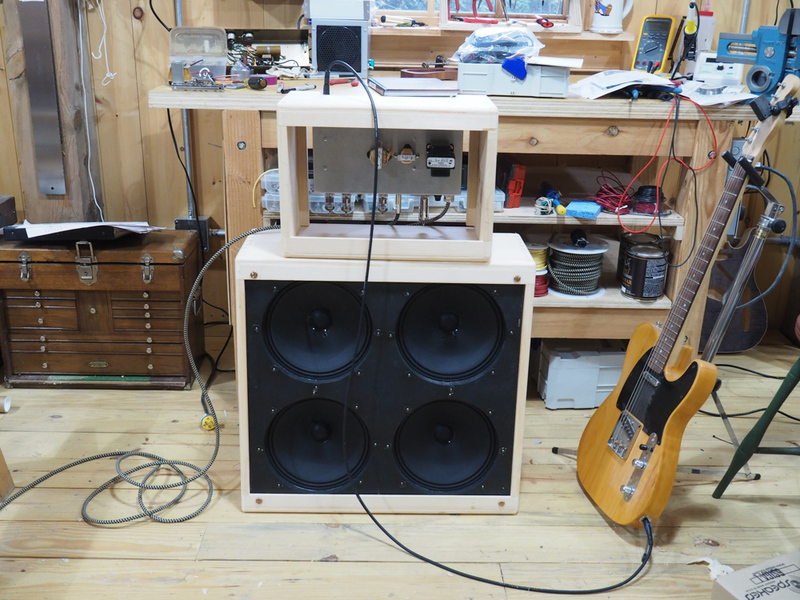 The second Bassman Micro has been built by ax84.com member "Lord of the Livingroom" and he says, "All in all, I’m giving Robs 5F6A-M project a thumbs up." Update: July 2015. 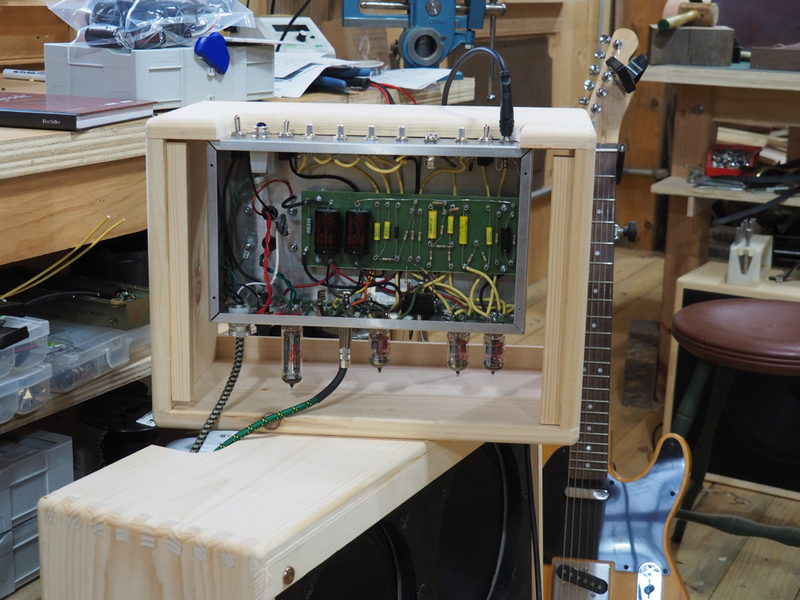 The first Bassman Micro has been built by David Jones. He reports excellent tone and playability. Pics of his build are featured below. Here's the first sound clip from David's Bassman Micro. David also found using a 1MA master volume pot made the tone stack more effective. These changes have been incorporated into the schematic and layouts on this webpage. Update: June 2015. I added a "poor man's FX loop" to the design. The Master Volume acts as the FX 'send volume' so you can feed your true 5F6A Bassman preamp into a PA or soundboard. You can also tap directly into the power amp by inserting a signal from a modeling preamp such as a POD HD500 by plugging it into the Return jack but since you are bypassing the preamp and volume controls you have to control the volume with the FX or guitar volume. After the Deluxe Micro turned out so well I thought I'd take on a more ambitious project and build a Micro version of the legendary 1959 Fender tweed 5F6A Bassman. The Bassman Micro tube guitar amplifier is a compact practice amp that's moderately easy to build, uses three 12A*7 tubes and puts out 2 to 4 watts of output power. 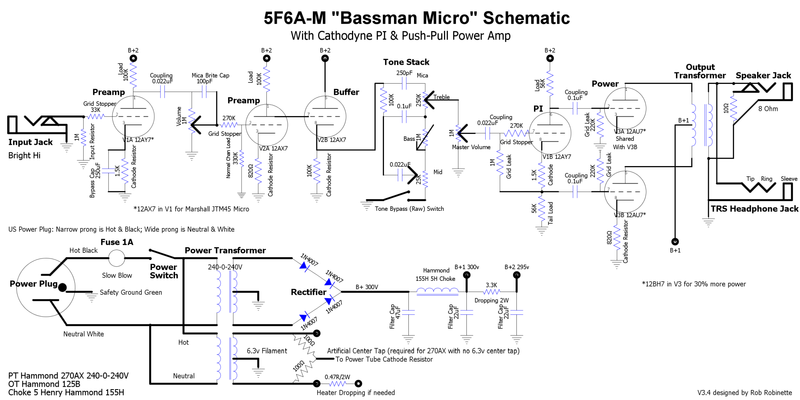 The Bassman Micro's single channel preamp circuit was inspired by the 5F6A Bassman's Bright Hi channel and the phase inverter is from the earlier 5E6A Bassman. The Marshall JTM45 preamp is an exact copy of the 5F6A except for the use of a 12AX7 in V1 so this amp could also be called the JTM45 Micro. The Bassman Micro features two stages of gain, a tone stack buffer, tone stack with Treble, Mid and Bass controls, a cathodyne phase inverter and a true push-pull power amp. 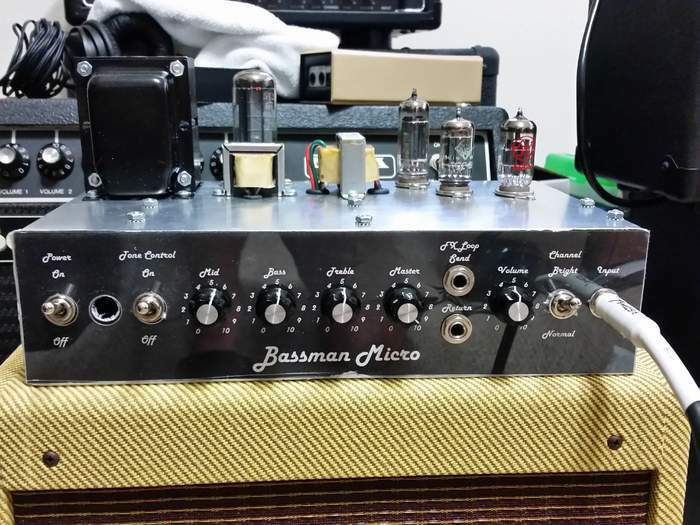 The Bassman Micro project utilizes full size amp, POTENTIALLY FATAL HIGH VOLTAGES. If you are unfamiliar with high voltage circuits or are uncomfortable working around high voltages, DO NOT RISK YOUR LIFE BY BUILDING THEM. Seek help from a competent technician before building any unfamiliar electronics circuit. RobRobinette.com DISCLAIMS ALL LIABILITY FOR INJURY OR PROPERTY DAMAGE RESULTING FROM THIS INFORMATION. ALL INFORMATION IS PROVIDED 'AS-IS' AND WITHOUT WARRANTY OF ANY KIND. 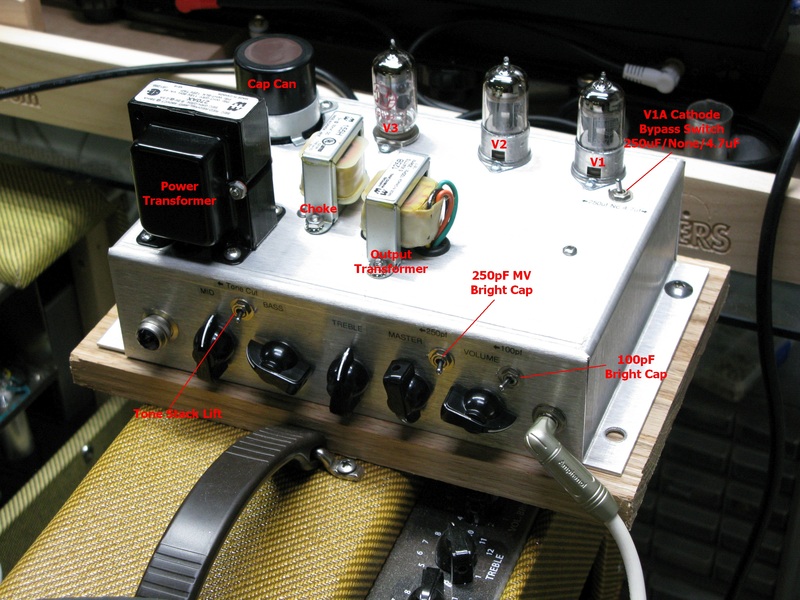 See more tube amplifier safety info here. Note the optional diode rectifier is shown (left edge of circuit board) along with an EZ81 tube rectifier--choose one rectifier. Click the image to see the hi-res layout. Download the hi-res PDF layout file. Note: the Negative Feedback NFB circuit has been deleted from the layout but if you do choose to use NFB I recommend a change to a 15k NFB resistor. Click here for the DIYLC layout file. David used tube rectification so the diode rectifier is deleted from the extreme left edge of the board. Photo by David Jones. Dan used a Hammond 12x7x3 aluminum chassis. 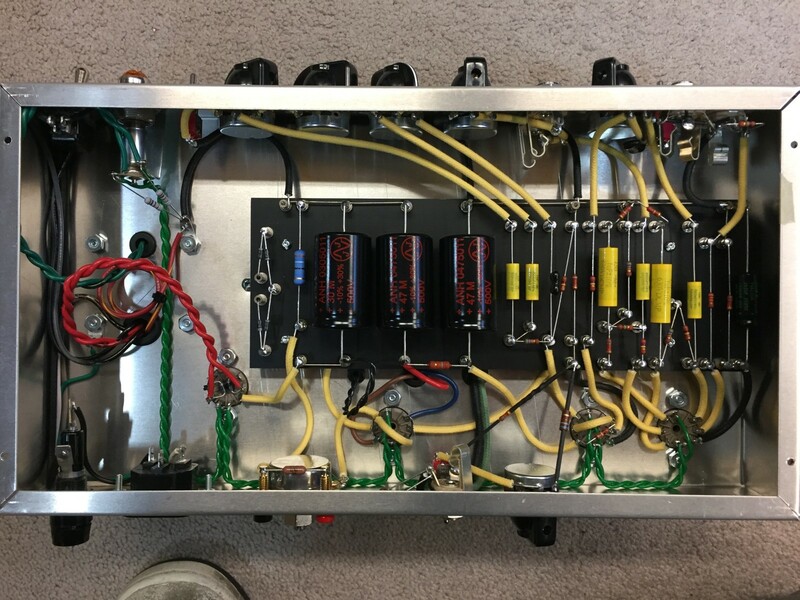 Photos and amp build by Dan Miller. 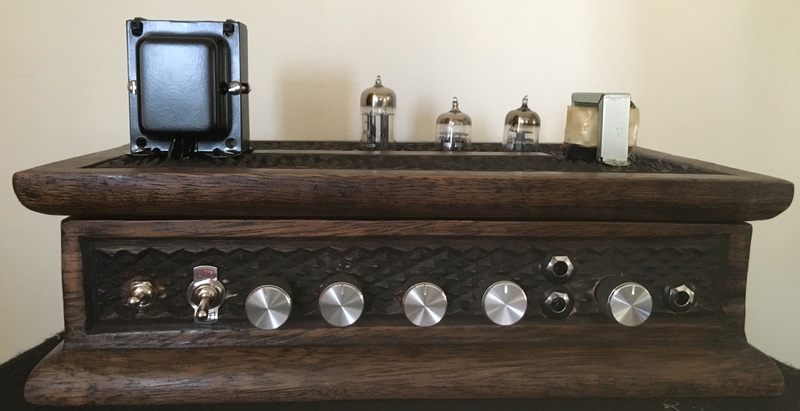 Faceplate design, amp build and photos by David Jones. I'm a big fan of the 1950's Fender tweed amps and the 5F6A Bassman is a legendary amp that was copied by Marshall and became the foundation of that company's amp lineup. 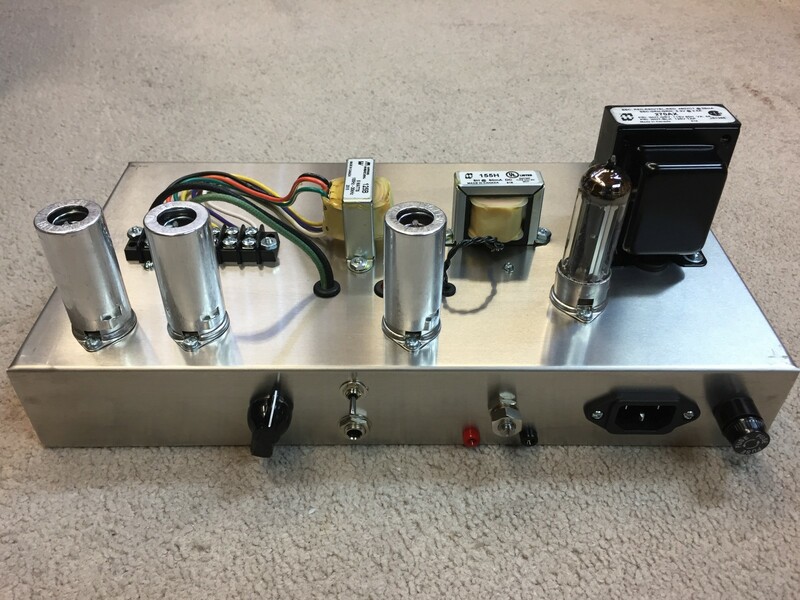 I built a 5F6A head amp and it's the sweetest sounding amp I've ever heard so I decided to design a Micro version of The Bassman. I used an almost exact copy of the Bassman's Bright Hi preamp channel and paired it with the earlier 5E6A Bassman's cathodyne phase inverter feeding a small bottle true push-pull power amp. Why a cathodyne PI? Because a 12AU7 power tube doesn't need the extra gain of the 5F6A's long tail pair phase inverter and the LTP PI would have required another tube. The greatest weakness of the cathodyne PI is if driven too hard it can develop nasty double-frequency distortion. I use a pre-phase inverter master volume paired with a 270k phase inverter grid stopper resistor to eliminate double-frequency distortion. I liked the output and flexibility of the 12AU7/12BH7 tubes for the true push-pull power amp. The 12AU7 with both triodes in push-pull will develop around 3 to 4 watts of output power. 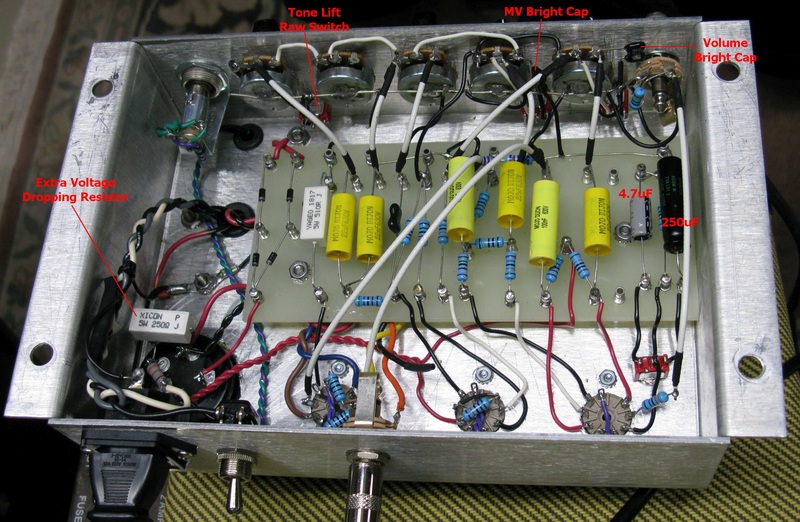 Swap in a 12BH7 and the output increases to 4 to 5 watts. My H&K Tubemeister 5 uses a 12BH7 in push-pull and it sounds very good. The 12AU7 and 12BH7 tubes are very similar in output tone but the volume boost from the 12BH7 is noticeable at around 30% more power. Both tube types are readily available with the 12BH7 going for about $5 more than a 12AU7. One of the reasons I chose to use the Fender 5F6A tweed Bassman preamp in this project is the Marshall JTM45 uses an exact copy of the circuit except Marshall calls for a 12AX7 in V1 instead of the Bassman's lower gain 12AY7. All that's required to convert the Bassman Micro into a JTM45 Micro is to put a 12AX7 in V1. A 12AX7 in V1 gives you much more overdrive and pushes the Bassman Micro's tone into the 1960's. I went with a small, 5 Henry 50 milliamp Hammond 155H choke to filter the B+ for the entire amp. I designed in a Bright/Normal Channel Switch because the only difference between the 5F6A's channels is the Bright Cap. By putting it on a switch you can choose between the Bright and Normal channels. The difference between Bright and Normal is very subtle with the 5F6A's 100pF bright cap but you can make it more effective by increasing the value to 500pF (or 470pF). The Tone Stack Bypass (Raw) Switch is an easy mod that removes the signal sucking tone stack from the circuit and delivers "raw" guitar tone. The signal will be 'boosted' and 'naturalized' when the tone stack is bypassed. My full sized 5F6A has this switch and I use it quite a bit to quickly get back to a set, standard tone. This switch also comes in handy if you like to use an equalizer pedal for tone shaping. The "poor man's FX loop" allows you to insert post preamp effects. The Master Volume acts as the FX 'send volume' so you can feed your true 5F6A Bassman preamp into a PA or soundboard. You can also tap directly into the power amp by inserting a signal from a modeling preamp such as a POD HD500 directly into the Return jack (guitar > HD500 > Return Jack) but since you are bypassing the preamp and volume controls you must control the amp's volume with the FX or guitar volume. You have the choice of using a simple solid state or a 9 or 8-pin tube rectifier. I recommend you use an EZ81 9-pin rectifier tube because it's low output will suit the low current needs of the Bassman Micro so you'll get a little voltage sag. The EZ81 will drop about 20 volts compared to a solid state rectifier. It uses a standard 9-pin socket and 6.3V filament heat so no 5V power transformer output is needed. If you want to use a full size 8-pin rectifier tube like a 5Y3GT which drops about 60 volts compared to a solid state rectifier then I recommend the higher voltage output Hammond 270CAX power transformer to compensate for the extra voltage drop. It comes with a 5V output for the 5Y3. Just wire the 8-pin socket with the high voltage to pins 4 and 6, 5V heater lines to 2 and 8 and the B+ power output wire to pin 8. 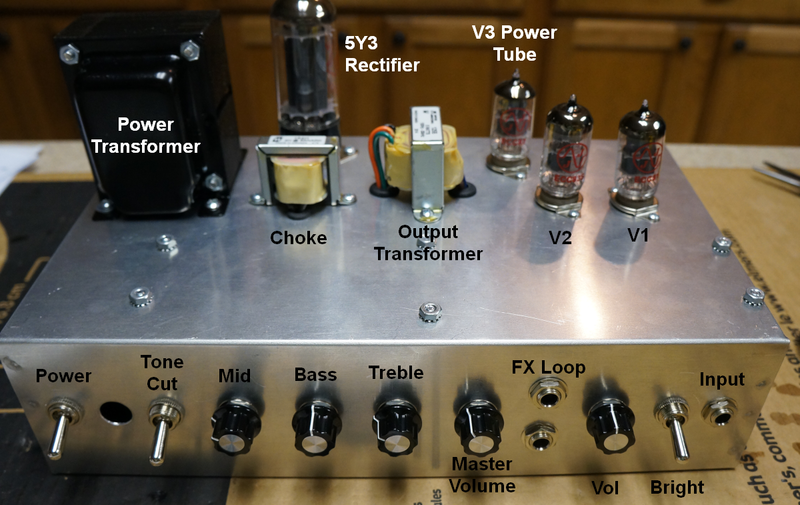 The Bassman Micro layout diagram shows both, a 4 diode solid state rectifier and an EZ81 tube rectifier--choose one and delete the other. Note: the Negative Feedback (NFB) circuit has been deleted from the layout but if you do choose to use NFB I recommend using a 15k NFB resistor. See this schematic for the NFB circuit. This undrilled JTM45 chassis will give you plenty of room and it will be easy to source a combo or head cabinet for the standard chassis size. If you don't want to drill your own chassis an 18 Watt amp chassis made for EL84 power tubes will work great since it will have five 9-pin tube holes already drilled--this is what I used. I plan to buy a combo cab and add a Weber 12" alnico speaker. North/South has been flipped for Marshall chassis layout. 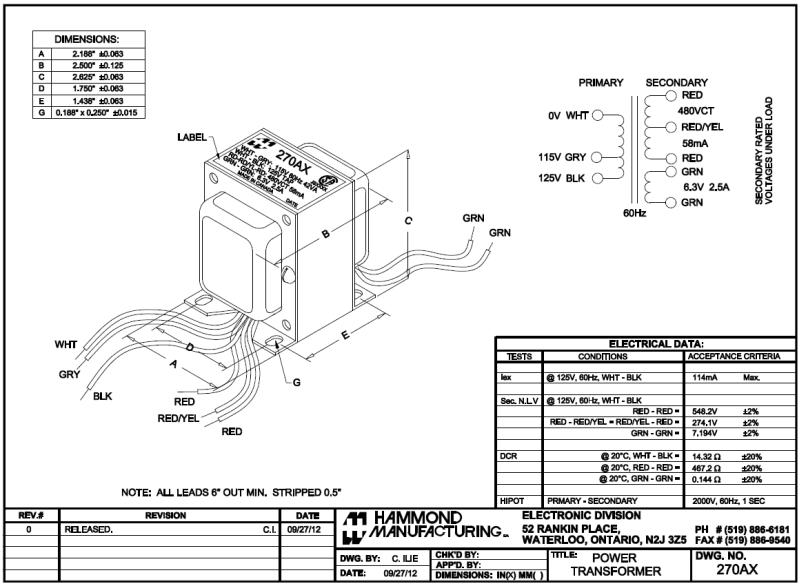 My recommended power transformers are the Hammond 270AX for the US and Hammond 370AX (available here) for international builders (has 100, 110, 120, 200, 220 and 240 volt primaries, see this for wiring instructions). They have 240-0-240V high voltage secondary output and 6.3V heater output. If you use solid state rectification you may need to add a 2 watt voltage dropping resistor before the first filter cap to bring the voltage down to around 315V DC at the first filter cap. The recommended output transformer is the Hammond 125B (or 125C for less compression and more volume but I believe the 125B will give the truest 5F6A tone). Use secondary wires 2 & 4 to give 22500:8 load impedance for 8 ohm speaker. The 12AY7, 12AX7 and 12AU7 all use 0.3 amps of 6.3v heater current. If you use an EZ81 rectifier tube it uses about 1 amp of heater current so any power transformer that supplies 2 amps of 6.3v for tube rectification will work. The optional Headphone Jack can be full size 1/4" or the now more common 1/8". The nice thing about a 1/8" jack is you won't mistake it for the Speaker Jack. The Speaker Jack has a 10 ohm 2 watt Headphone Resistor across it to load the output transformer with an 8 ohm load when headphones are plugged in. The 10 ohm resistor is automatically disconnected when a speaker is connected. Be careful with the volume control when using headphones. Make sure it is at minimum volume when the amp is powered up and turn the volume knob slowly to keep from blowing out your headphones and ears. If you don't want the headphone jack simply delete the jack and the 10 ohm headphone resistor. The Headphone Resistor gives the additional benefit of loading the output transformer with a 10 ohm load to prevent damage if you forget to plug in a speaker. There is a jumper on the headphone jack from Tip to Ring to send the guitar signal to the Left and Right headphone channels. Red variac controls just the high voltage AC to the amp. Separate 6.3V transformer supplies heater current. During the test and tweak phase of development I compared the Bassman Micro to my 5E3P Deluxe (top right in tweed cabinet), my Deluxe Micro, a Firefly micro amp (just left of the red variac) and an H&K Tubemeister 5 (on top of the Deluxe). I played them all through a Weber 12A125A 12" Alnico speaker in an open back extension cab (behind table), a 15" JBL E130 with hemp cone (in the 5E3P cab) and an Eminence 620H hemp coned 6" speaker in a small enclosure (on top of the Deluxe). 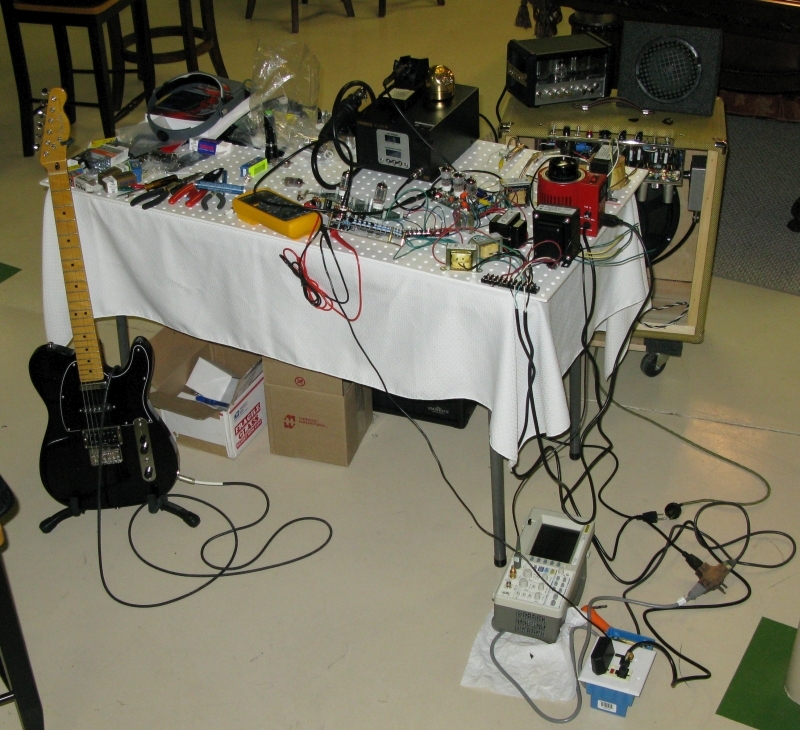 The blue box at bottom right next to the oscilloscope is a bucking transformer used to lower the heater voltage to spec. I added a Master Volume to the power amp because it's needed to control how hard the little 12AU7 power tube is driven. The Master Volume also does a good job of controlling the output for true bedroom amp volume levels. The Master Volume is also very helpful when pedals are used with the amp because you can keep from overwhelming the little power tube when using high output FX. At max Master Volume setting the Master Volume has no impact on the circuit--it's as if the Master Volume is not there. You need to play with the Master Volume to get the most out of this amp and to control the balance of preamp and power tube distortion. 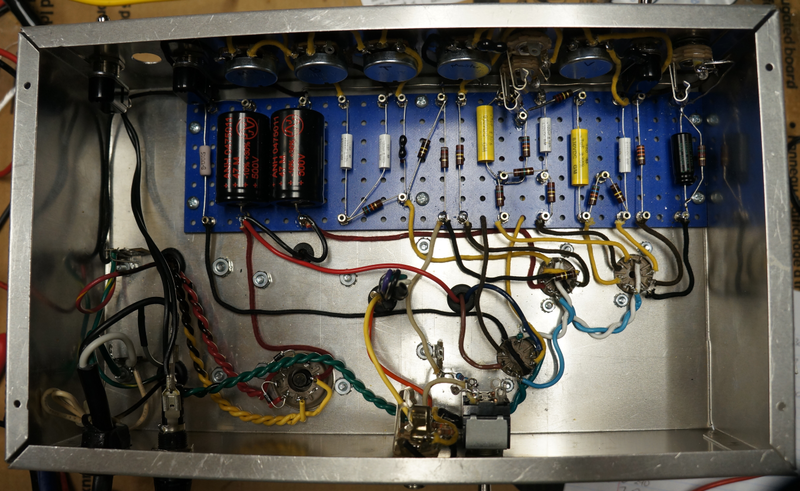 The Volume pot controls the preamp tube and the Master Volume controls the power tube. Some high output guitar pickups and effects pedals can push the power tube too hard and cause some funky power tube blocking distortion. If this occurs just dial back the Master Volume a little. I have an Electro-Harmonix 12AY7 in V1, Tung Sol 12AX7 in V2 and an EH 12AU7 in V3. I typically set the Bass control low at about 3 and leave it alone and then play with the amp's two volume controls--don't set the Master Volume and forget it, it has a lot of affect on the amp's tone. When you want to really turn up the overdrive try a 12AX7 in V1 which converts the amp into a Marshall JTM45 Micro. The Bassman Micro handles a 12AX7 in V1 well because the Master Volume can keep the little power tube from being overdriven into oblivion. I'm really surprised all micro amps don't have a Master Volume, it really is necessary to make a micro bottle power amp versatile. For the dirty sounds I set the volume to about 3 o'clock and the master volume to about 10 o'clock. For the clean sound I set the master volume to max and the volume to about 10 o'clock. Bass, Treble and Mid were all set to 12 o'clock. I had the feedback switch in the middle position (off). I played the Bassman Micro through three different speakers during testing: My favorite Fender tweed era speaker is the Weber 12A125A 12 inch Alnico in an open back cab. The little Bassman Micro sounded best with this pairing--very rich and tweedy and it made my Telecaster sound like a Tele should. The 12A125A is a low efficiency speaker rated at 95dB but the Bassman Micro still put out plenty of volume at high Master Volume settings. Finally I hooked up my 5E3P Proluxe's 15 inch JBL E130 hemp coned speaker to the Micro. It's a very high efficiency (105 dB) driver that pumps out loud, clear, accurate guitar tone. The Bassman Micro was crazy loud and sounded fantastic. I really had fun with this speaker for high distortion shredding with a 12AX7 in V1 but it was loud enough that my wife had to intervene. I recommend you go with an 8" or larger speaker because this amp sounds too good to be strangled by a 6" speaker. Bottom line is any speaker that works with a full size tweed amp like the Deluxe or Bassman should work well with the Bassman Micro. I compared the Bassman Micro's tone to my Firefly micro amp (single self-split push-pull 12AY7 power tube) and H&K Tubemeister 5 (push-pull 12BH7 power tube). The biggest difference in tone is the Bassman Micro's low end. It's always there no matter how hard you shred the little amp, while the Firefly and Tubemeister scream with modern high pitched accuracy. You could really hear the difference between the two amps through the big 15" JBL but the Bassman Micro blows away the other amps when playing clean through the Weber 12A125A 12" alnico. For the most authentic 5F6A Bassman tone I highly recommend Weber Alnico speakers. Their Vintage and Signature Alnico speakers drip Fender tweed tone. They offer two lines in sizes from 6 to 15 inches. I personally love my Weber Vintage 12A125A 30 watt light dope (12" Alnico, 1.25" voice coil $108) but people really like the Signature line that runs at about half that price and $55 is crazy low for a nice 12" Alnico speaker. The $999 Fender Eric Clapton Vibro Champ comes with an 8 inch Weber Signature Alnico. If you want to be true to the Bassman design a nice 4 x 10" cab with Weber Vintage 10A125A 30 watts would be my choice. The less expensive 10" Signatures would also be a good fit. For a more modern, mid-1960's tone with tighter bottom end the 10F150 with ferrite magnet and larger 1.5" voice coil is a good choice and would be my first choice for a Marshall JTM45 tone. Keep in mind all these speakers need a break in period and will sound better after being worked in. Weber offers a free break in service so they will sound perfect right out of the box. The Warehouse Speakers 10" Veteran is another great fit for this amplifier at $41 each. For ultimate convenience building a small combo amp paired with an 8 inch Weber Vintage 8A150 speaker is probably the way to go but be sure and try the Bassman Micro with other speakers so you can really appreciate how good it sounds with a real, full sized tweed speaker. 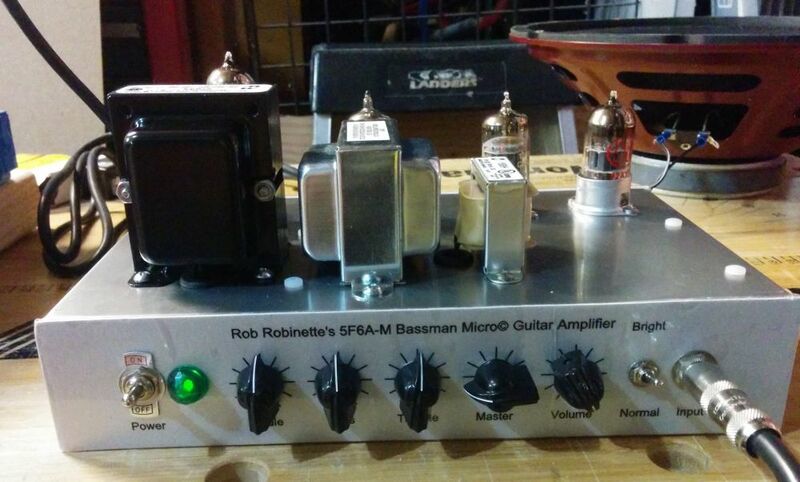 If you like to mod your amps many of my 5E3 modifications and 5F6A Bassman modifications apply to the Bassman Micro. I get most of my parts from Tubedepot.com, Hoffmanamps.com and then Mouser.com for everything else. Use a 12AX7 in V1 for a JTM45 Micro. Voltage Dropping Power Resistor 3.3K 2W 2 watt or greater. Doug will build a Bassman Micro circuit board and even populate it if you wish. Visit Doug's website. Rough estimate of total cost of the chassis is about $285. Start with the circuit board, either eyelet, turret, B9A development board or even perfboard. The circuit board should be at least 8 1/2" x 2 7/8" by 1/8" thick. Use #3 Eyelets or Turrets for 1/8" (0.125") thick board. Install the rest of the components to populate the board but don't start soldering until they are all in place and you're sure they are placed correctly. Make sure the negative terminals of the big electrolytic filter capacitors are connected to ground because they may explode and damage the output transformer if installed backwards. Most filter caps have an 'indention' on their positive end and arrows pointing to the negative end. Remember to leave the turret top holes available for leads that run from the turret to the tubes, controls and jacks. I use the '3/4 lead wrap around the turret' method which is old mil spec. Install tube, jack and control wires to the circuit board and leave a couple inches of extra wire so you can trim to fit later. 22 gauge wire is fine for all the amp's wiring including the heater wires. I recommend you connect the 6.3V filament heater wires from the power transformer directly to the rectifier diodes or tube, then split two wires from there: a set of wires to the pilot light and one to V3 then on to V2 and V1. For wire color I like to use yellow for the signal path, red for power, black for ground and cathodes and green for heaters. This is a good time to post a pic of the board (front and back) on a guitar forum for others to review. 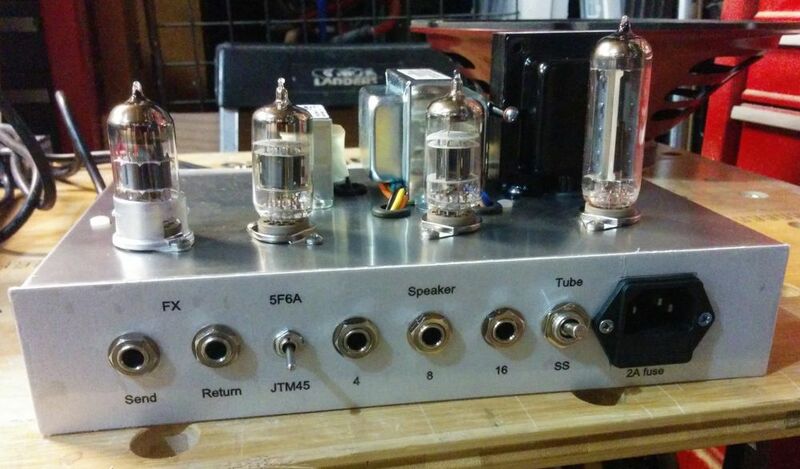 I like the TDPRI Shock Brothers DIY Amps forum (I'm robrob). Be sure and keep a photo of the back side of the board so you can review it in case you have to troubleshoot the amp at startup--you don't want to have to remove the circuit board to verify its backside wiring and solder joints. I used a spare Marshall 18 Watt chassis for my build. It's designed for 9-pin EL84 power tubes so there's plenty of small 9-pin tube socket holes available. It's also easy to find or build an 18 Watt cab. The 5E3 Deluxe chassis may work to fit the 8 1/2" x 2 7/8" circuit board. You will need 1 or 2 (2 for tube rectifier) octal-to-noval (8-pin to 9-pin) hole adapters so you can fit 1 or 2 tubes where the 6V6 power tubes would go. You will also have some extra input jack holes but you can use these holes to mount switches for things like switched negative feedback and the bright switch. You can always use a normal, 8 pin sized 5Y3GT as the rectifier tube since that size hole is already available. This is probably the easiest way to go because there are so many 5E3 combo cabs and head cabinets available. You can also go with a 'table top' style chassis that could easily be installed in a small cab. The Hammond 1444-1273 12 x 7 x 3" blank chassis is perfect but you will have to drill your own jack, pot and tube holes using a step drill bit. Most of us in the U.S. will want to use the 125V primary tap so the White and Black wires would be used (heat shrink the unused Gray wire). The transformer's Black wire connects to the power cord's Hot-black-narrow prong wire. The White wire connects to the power cord's Neutral-white-wide prong wire. Connect the power cord's green safety ground wire to a transformer mounting bolt. For output power to the rectifier use the two Red wires for 240-0-240V of high voltage. The Red/Yellow center tap wire connects to the negative terminal of the B+1 Filter Capacitor. The two green 6.3V wires go to the pilot light and all tube heaters. Note the EZ81 rectifier tube has non-standard heater pin numbers. International builders should use the Hammond 370AX with 100, 110, 120, 200, 220 and 240v primaries. Don't forget to connect the Brown and Black wires together. 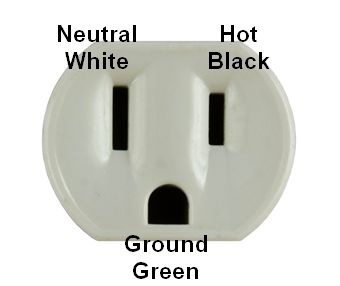 Modern U.S. wall cords and sockets have a narrow blade for Hot (black wire 120v), a wide blade for Neutral (white wire ground), and a round or 'D' shaped prong for the chassis Safety Ground (green wire ground--the Neutral and Safety Ground are connected at the main circuit breaker box). Power cord wire colors are sometimes non-standard so use a multimeter to identify Hot and Neutral. Install the circuit board and connect all the leads. Post detailed pics for forum review before applying power. I recommend you follow my Amp Startup Procedure. Following it can prevent damage from a miss-wired amp. If you have a light bulb current limiter you should use it for the startup. My power transformer is rated at 240-0-240 volts AC RMS but I measured 257 volts on each wire at the rectifier input due to my high wall voltage of 125.3V. Yes, that is 514 AC volts measured wire-to-wire so be careful when measuring live voltage in this amp. It's a teeny-tiny amp but it uses big amp voltage. Bias With 295V on the plates and 9V on the cathode the plate-to-cathode voltage is 286V. I plugged those numbers into my tube bias calculator along with the 519 ohm measured cathode resistor, 1 "tubes" sharing one cathode resistor it calculated: 17.6 milliamps, 5 watts and 90.9% of max dissipation. 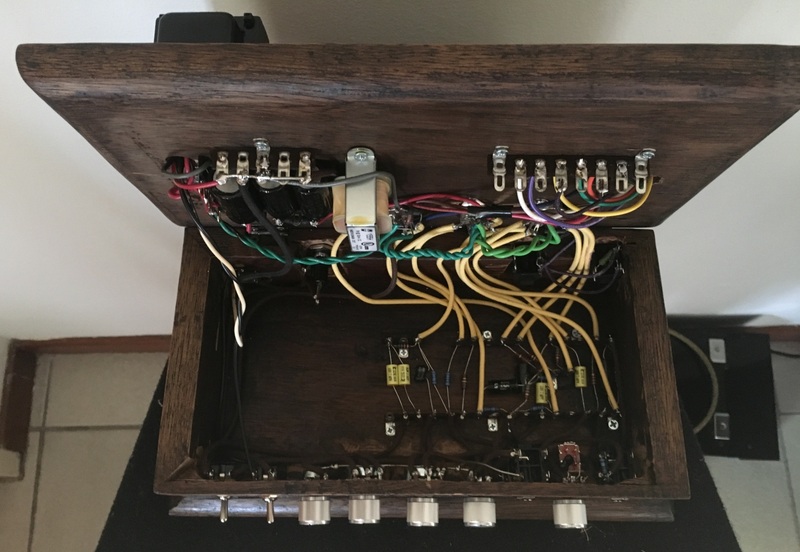 David chose to use a 5Y3 rectifier tube and Hammond 270CAX power transformer. Photo by David Jones. Build and photos by Kevin Barlow. 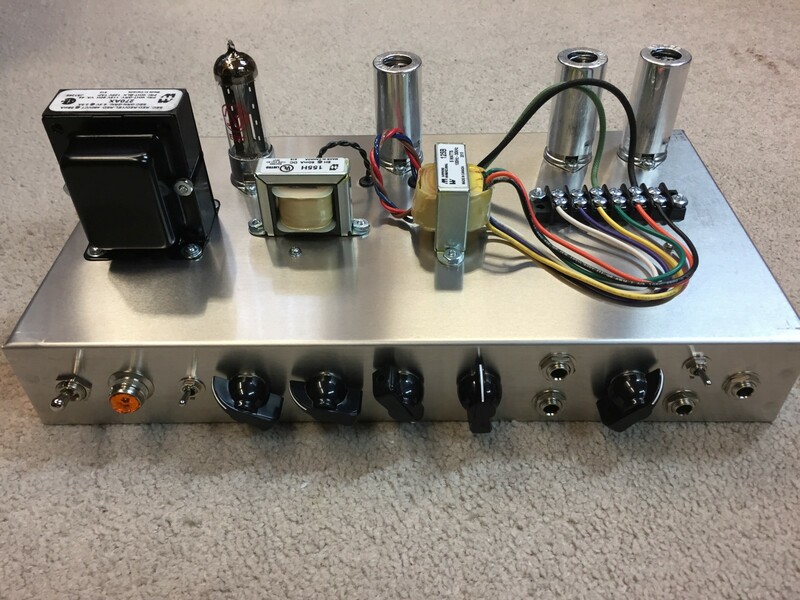 Kevin added my Tube/Solid State rectification switch 5F6A mod. See more of Kevin's photos here. 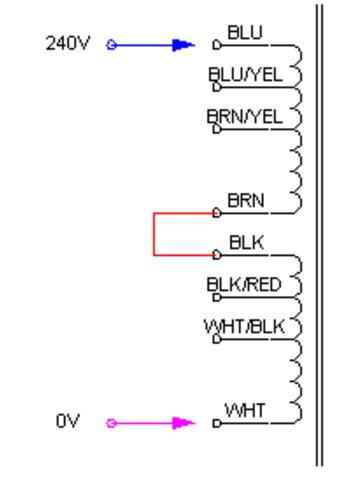 Signal flow shown in yellow highlight. The guitar signal enters at the input jack at upper left. Flows through the grid stopper resistor to the V1A (Valve 1, first half) grid for its first stage of amplification, out the plate through a coupling cap to the bright cap and volume control. The bright cap bypasses some high freqs around the volume control. The signal then goes through a 270k grid stopper to V2A's (Valve 2, first half) grid for more amplification, out the plate directly to V2B's grid. V2B acts as the Tone Stack Buffer. The signal flows out its cathode to the Tone Stack, exits via the Treble control's wiper to the Master Volume, out through a coupling cap and grid stopper resistor to the V3A Phase Inverter. The phase inverter splits the signal into two 180 degrees out of phase signals. One signal goes from the phase inverter's plate through a coupling cap to the V3A Power Tube's grid and the other signal goes out the phase inverter's cathode, through a coupling cap to the V3B power tube's grid. The signals leave V3A & B via their plates and flow through the output transformer to the speaker jack and speaker. Note: the Negative Feedback NFB circuit has been deleted from the layout but if you do choose to use NFB I recommend a change to a 15k NFB resistor. The low voltage alternating current (AC) audio signal from the guitar's pickup coils enters the Bassman Micro at the Input Jack. Typical signal level from the guitar pickup coils is about 0.1 volt rms but can vary greatly due to the number of pickups, their design and of course how and what is played on the guitar. Soft jazz notes with a vintage single coil pickup can be in the single digit millivolt range (0.001v). The first component the guitar signal encounters is the 1 megaohm impedance bridging Input Resistor. Impedance bridging just means the guitar's and amp's impedance match up correctly for optimum voltage signal transfer (low impedance guitar, high impedance amp). The Input Resistor also functions as the grid leak resistor for tube amplifier stage V1A (valve 1, first half of the tube). A grid leak resistor 'leaks' off unwanted DC (direct current) voltage on the tube's control grid to keep the grid at 0 volts DC. The Control Grid needs to stay at 0 volts DC to keep the tube bias correct. The amplified signal leaves the tube through the Plate and encounters a Load Resistor and Coupling Capacitor. High voltage DC power used by the tube is brought in through a Load Resistor. The Load Resistor converts the amplification stage from current amplification to voltage amplification. 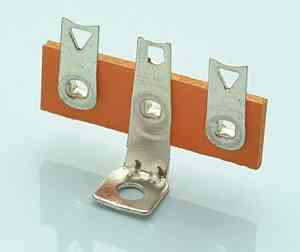 The wire between tube pin 1 (plate) and the Load Resistor carries up to 250 volts DC. This wire carries both the AC audio signal and the high voltage DC power the tube needs. The Coupling Cap blocks the high voltage DC on the Plate but allows the AC guitar signal to pass through to the Bright Cap. The Bright Cap brightens the guitar signal by allowing high frequencies to pass around the Volume Control Potentiometer (pot), which is a variable voltage divider that bleeds the guitar signal to ground at low volume and lets the signal pass at high volume. The signal then passes a 270k grid stopper and enters Tube V2A (valve 2, first triode) for its second stage of amplification. The amplified guitar signal exits the tube via the Plate and flows directly into tube V2B (DC coupled) which acts as the Tone Stack Buffer. The buffer keeps the tone controls from loading down the V2A preamp stage. The signal exits V2B at its cathode and flows into the Tone Stack which filters the signal using the Treble, Bass and Mid pots. The signal exits the Tone Stack and hits the Master Volume and Master Volume Brite Cap. The Brite Cap passes high freqs around the Master Volume to keep the signal from getting too dark at low Master Volume levels. The Master Volume controls the signal level that flows through a 270K ohm grid stopper resistor to Tube V2B's control grid. The large value 270K grid stopper helps prevent blocking distortion in the Phase Inverter. V2B functions as a Phase Inverter. It creates two signals that are 180 degrees out of phase with one another. These two signals then feed into the push-pull power tube V3A and V3B. Tube V3 functions as our power tube and is a 12AU7 twin triode tube . Both triodes are used to form a push-pull power amp. This final stage of amplification creates a high voltage, low current signal which is passed to the output transformer. The Output Transformer's primary takes in a high voltage, low current signal (high impedance) and puts out a low voltage, high current signal (low impedance) through the blue wire to the speaker jack and on to the speaker. Typical Bassman Micro output is 1 to 2 watts into an 8 ohm speaker with a 12AU7 power tube and 2 to 4 watts with a 12BH7. The Speaker's Voice Coil needs high current to create the magnetic field that interacts with the Speaker Magnet to make the voice coil and Speaker Cone move in and out creating the air pressure waves our ears perceive as the sweet sound of electric guitar. Here's an even more faithful (and complicated) version of the Bassman Micro with a long tail pair phase inverter, NFB with Presence control, Preamp Master Volume and Post Phase Inverter Master Volume (PPIMV). The LTP provides a more authentic 5F6A Bassman overdrive tone and allows the exact 5F6A presence circuit to be used. 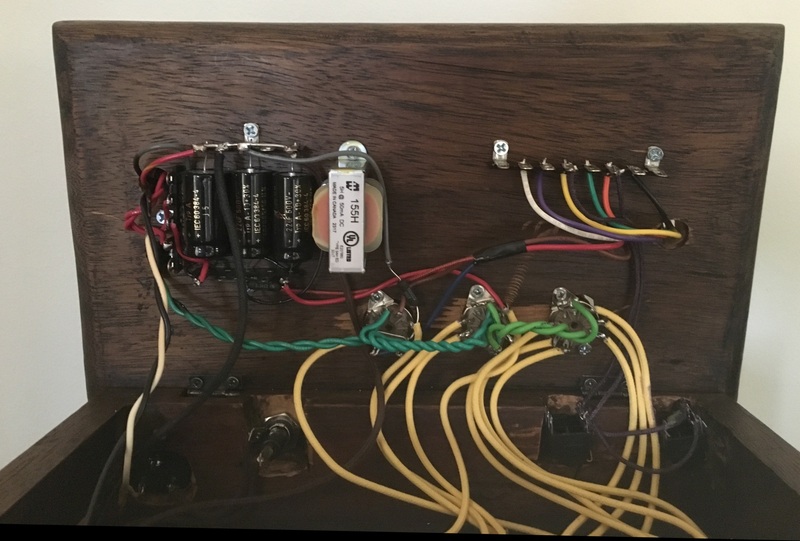 The 5F6A NFB and Presence circuits are added to more closely replicate the famous 5F6A tone. The Post Phase Inverter Master Volume (far left control) can easily be deleted by removing the pot and its two wires. Click here for the DIYLC Layout file.